is a new alternative therapeutic method based on technology generating non-focused shockwaves, a so called "ballistic principle". The pulses are transferred via a convex surface on the applicator resulting in a radial or conical dispersion of the energy in every single shockwave. The increase in pressure in the tissue is built up very quickly resulting in a high energy level and appropriate energy dispersion in the tissue. There is ongoing extensive research on the phenomenon; increased blood circulation, local anaesthetic effect and improved tissue metabolism are documented effects. The treatment stimulates and effectively supports the underlying mechanisms of the body’s self repairing abilities. It is common to experience immediate pain relief and thus improved mobility. A thorough clinical and functional examination is performed before any treatment is initiated. Ultrasound diagnostics and MR can be good supplements to diagnosing and localizing tissue changes, i.e. where you have calcification in the joints and adjoining structures (ligaments, tendons and muscles). It is usual to apply a treatment dose of 2000 pulses to the painful area. The applied pressure (measured in bar, 2-4 bar is common) varies given the individual patients tolerance and indicated pain focus. The treatment itself seldom exceeds 10 minutes and is repeated with intervals of approximately 7 days. A series of 2-5 treatments are often sufficient. Treatment is not to be performed in parallel with injections (cortisone) or other kinds of medication. Only insignificant side effects are reported, but small haemorrhages in subcutis may occur. These do not give any symptoms and disappear in a few days. Moderate soreness may also occur a few hours after treatment. This condition can last for a couple of days. If this is experienced as troublesome, ordinary prescription-free pain-killers will normally give effective pain relief. The Swiss company Electro Medical Systems (EMS) uses compressed air and a mechanical piston in its Swiss DolorClast®. 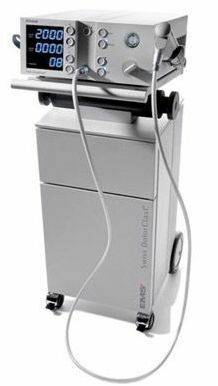 Radial shockwave Therapy has proved itself effective in the treatment of multiple pain conditions in joints and adjacent tissues. The frequency area is 1-15 Hz, and the shockwaves are transmitted through a pulse generator / piston the therapist is free to move across the painful area. is based on technology generating focused shockwaves. Through applying focused shockwaves a distinct effect area is created deep in the tissues. The method demands support from other technologies (such as sonography) to ensure maximum precision. This technology is known from kidney stone treatment: “the kidney stone crusher”. Extracorporeal Shockwave Treatment with focused shockwaves is always performed in medical clinics and hospitals. As distinct from radial shockwaves focused shockwaves (ESWT) have a somewhat limited area of application because many orthopaedic conditions are diffusely distributed in muscle and connective tissues. Moreover, the technology is very expensive, demands a high service level and the instrument itself is big. The treatment is often combined with local anaesthesia because it otherwise is very intense and painful. In Europe, focused shockwaves in orthopaedics have primarily been used in clinics in Germany, Switzerland and Austria.